If you aren't sure about your career path, and are interested in a variety of subjects and fields, an online liberal arts degree may be a good fit for you. This bachelor's degree program provides an overview of many disciplines across the arts and sciences. By choosing a general liberal arts major, you'll enjoy the flexibility of multiple career options and income potential. According to the Condition of Education 2017 report, liberal arts majors between the ages of 25 and 29 earn a median annual salary of $39,090. An online liberal arts degree can expose you to several different professional or academic passions, and can be the first step towards a rewarding career. Pursuing a liberal arts degree online provides students with a foundation of knowledge rooted in the arts, sciences, and humanities. The wide range of courses in English, mathematics, science, and philosophy will deepen your analytical and critical thinking skills. Graduates with a liberal arts degree typically have excellent writing, communication, and public speaking abilities. As the degree itself doesn't delve deeply into any one subject, many students opt to supplement it with a minor. Popular choices include business, communications, political science, economics, media, and computer science. A minor can help students direct their studies once they've discovered a passion without requiring them to change their major. Harvard University ranks #1 on The 50 Best Online Bachelor's in Liberal Arts Programs! Harvard University, one of the most respected institutions of higher education in the world, offers an online liberal arts degree through its Extension School. This program caters to students aged 21 or older with high school diplomas who have not yet completed an undergraduate degree. Students build well-rounded academic foundations through the program's rigorous course of study. Students develop effective written and verbal communication skills and the ability to critically engage in a range of subject areas. Harvard's customizable BA in liberal arts degree requires 128 credits and typically takes four years of full-time study to complete. Students choose from three concentrations. The humanities concentration emphasizes English, writing, religious studies, and philosophy. The science concentration covers mathematics, computer science, biology, and environmental studies. The social science concentration focuses on anthropology, economics, history, and psychology. Students may also declare a specific field of study, akin to a major, allowing them to develop specific skills relevant to their individual learning goals. Students in this program complete the degree primarily through online study in an asynchronous format, but the university believes degree-seekers benefit from experiencing life on Harvard's campus in Cambridge, Massachusetts. Degree candidates must complete at least 16 credits (typically four courses) of on-campus study. Intensive three-week and weekend on-campus options allow students to fulfill this requirement as quickly as possible, but many choose to remain on campus for longer periods of time. Harvard's Extension School relies on an innovative admissions process. Candidates pass an online test of academic reading and writing skills. They then enroll in a course covering academic reading and writing skills and two other degree classes of their choosing. Once they complete these three classes with grades of B or better, they may apply for full admission to the program. This program accepts transfer credits in many cases, and students may apply up to 64 credits from other institutions to this respected Harvard degree. Harvard University is regionally accredited by the New England Association of Schools and Colleges (NEASC-CIHE). Oregon State University ranks #2 on The 50 Best Online Bachelor's in Liberal Arts Programs! OSU offers two highly customizable liberal arts bachelor's degrees online. Candidates interested in these flexible programs work with advisors to develop courses of study that match their specific learning interests. Students can earn BA degrees with concentrations in arts, humanities, education, or social science. Alternatively, they can pursue BS degrees with science and technology emphases. OSU's liberal arts degrees both require 180 total credits of study, and typically take four years to complete through asynchronous online study. Students must earn 45 or more credits with a thematic concentration, and take at least one writing intensive class. They may also select a minor if they choose to pursue a second concentration. Candidates must maintain 2.3 GPAs or better in major courses to graduate. OSU supports student success with academic and financial aid advisement services. OSU provides tutoring services on the university's Corvallis, Oregon campus as well as online. All students can access information technology and computing support to help them address technological challenges. Incoming students apply with high school transcripts, and the program typically accepts candidates with GPAs of 3.0 or better and competitive ACT or SAT scores. Applicants must have high school experience in English, mathematics, social science, science, and foreign language study. The program also accepts transfer students who have earned at least 24 credits from other regionally accredited higher educational institutions. OSU offers course credit for some forms of military experience and through testing. However, students in the liberal arts program must complete at least 45 of their final 75 credits at OSU. Oregon State University is regionally accredited by the Northwest Commission on Colleges and Universities (NWCCU). University of North Carolina at Greensboro ranks #3 on The 50 Best Online Bachelor's in Liberal Arts Programs! UNCG offers a flexible online liberal arts degree that primarily caters to adult students with some previous college experience. This degree draws on the university's interdisciplinary resources to give students opportunities to design courses of study that fit their own educational and career goals. UNCG's bachelor's of arts in liberal studies, delivered online asynchronously, requires candidates to earn 122 total credits to graduate. This degree typically takes four years of full-time study to complete. Degree candidates choose from three concentrations. First, the humanities concentration covers topics in arts, literature, history, philosophy, and religion. This concentration helps students develop strong critical thinking and communication skills. Second, the social science concentration, which teaches students to scientifically investigate human behavior and covers anthropology, economics, geography, psychology, and sociology. Third, the professional studies concentration prepares students for workplace success by teaching professional writing, business ethics, business and politics, and social science. This undergraduate liberal studies program typically accepts students with who hold 60 credits from other higher educational institutions with a GPA of 2.5 or better. Candidates apply with high school and previous college transcripts. The program offers two start dates per year, allowing students to begin their studies at times that best fit their personal needs. UNCG maintains generous credit transfer policies for incoming transfer students, but degree candidates must complete at least 31 credit hours at UNCG to graduate from this program. Online students permanently residing in North Carolina qualify for in-state tuition rates. The University of North Carolina is regionally accredited by the Southern Association of Colleges and Schools Commission on Colleges (SACS). University of Massachusetts - Lowell ranks #4 on The 50 Best Online Bachelor's in Liberal Arts Programs! UMass Lowell's BA in liberal arts program allows students to gain well-balanced academic training while choosing their own areas of concentration. Available in both online and hybrid formats, this degree offers distance learners a level of flexibility well-suited to working adults and those with previous college experience. Students pursuing this liberal arts degree online must complete 120 to 122 credits, typically in four years of full-time study. Learners choose two concentrations from nine possible subject areas. Concentration options include art history, economics, English, gender studies, history, legal studies, philosophy, political science, and psychology. Candidates must maintain a GPA of 2.2 or higher to graduate. UMass Lowell supports all students through peer tutoring, writing support, and personalized academic advisement resources. The university provides career advisement and professional development workshops. Technical support staff, available any time of day or night, helps online learners overcome technological problems. Candidates apply with high school or previous college transcripts. Prospective students under 21 years of age with fewer than 12 credits from other higher educational institutions may need to submit ACT or SAT scores as well. UMass Lowell accepts transfer credits from most regionally accredited colleges and universities, as long as the student earned a grade of C- or higher and the courses are similar in content to ones offered by UMass. UMass Lowell abides by the Commonwealth Transfer Compact of 1990, which facilitates incoming credit transfer for Massachusetts residents who have earned at least 60 credits at community colleges in the state. The University of Massachusetts is regionally accredited by the New England Association of Schools and Colleges (NEASC-CIHE). University of Illinois at Springfield ranks #5 on The 50 Best Online Bachelor's in Liberal Arts Programs! UIS offers a liberal studies online degree that helps students develop the critical thinking, problem-solving, and communication skills they need to become responsible and engaged citizens. This program of study allows degree candidates to draw upon academic resources from different departments to design personalized educational experiences. Students work with program advisors to choose classes that teach a breadth of skills while addressing individual learning goals. The UIS bachelor's in liberal studies degree typically takes a total of four years of full-time study. After completing the university's general education requirements in their first two years of undergraduate study, degree candidates take a class in self-directed learning that helps them plan their remaining courses. Students then select major core courses that allow them to concentrate on a specific subject. Students must take at least one class from each of seven thematic concentrations. These major classes cover topics related to identity, work, nature, institutions, language, heritage, and art. This online liberal arts program only accepts candidates with 30 general studies credits from UIS or elsewhere. Applicants must supply transcripts from high school and previously attended higher educational institutions. They must also submit written statements describing their academic and professional goals, technological skills, and why they want to seek an interdisciplinary degree. The university carries on a tradition of helping transfer students complete their degrees; transfer students with 60 or more credits from other regionally accredited institutions with a GPA of 2.0 or better may choose to enter the program as juniors, and earn their BA in liberal studies degrees in two years of study at UIS. The University of Illinois is regionally accredited by the Higher Learning Commission (HLC). Troy University ranks #6 on The 50 Best Online Bachelor's in Liberal Arts Programs! Troy, a public university located in Troy, Alabama, offers a practical liberal arts program online. This degree brings together academic resources from different departments to equip program graduates with the critical thinking, analytical, and communication skills demanded by top employers in the region. Troy's interdisciplinary course of study gives graduates the diverse and well-rounded competencies they need to succeed in liberal arts jobs, such as management, sales, graphic design, teaching, and social work. Troy's BS in liberal studies, developed with working professionals in mind, typically takes four years. After fulfilling the university's general education requirements, students pursuing this liberal studies degree must earn 60 credits in major core classes and maintain GPAs of 2.0 or better. Students are able to select classes that best match their interests. Degree candidates learn about methods of critical inquiry, then choose general elective classes covering diverse topics, such as anthropology, economics, folklore, English, geography, psychology, and political science. Candidates then select classes in each of four concentration areas: social studies, behavioral studies, psychology and language studies, and global studies. First-time freshmen under 25 years old apply with high school transcripts proving a GPA of at least 2.0 and competitive ACT or SAT scores. Freshman candidates older than 25 do not need to submit standardized test scores. Transfer students who have completed at least 24 credits at other regionally accredited educational institutions supply transcripts from previously attended colleges. Troy admissions specialists work with transfer students to evaluate transfer credits on an individual basis. Troy University is regionally accredited by the Southern Association of Colleges and Schools Commission on Colleges (SACS). Colorado State University - Fort Collins ranks #7 on The 50 Best Online Bachelor's in Liberal Arts Programs! CSU Fort Collins offers an online liberal studies degree that helps students develop a broad set of analytical and interpersonal skills. This program allows degree candidates to explore various academic subjects while gaining experience with different modes of perception and professional situations. This degree's well-rounded curriculum teaches students the writing, verbal communication, and critical thinking abilities sought by employers. Students in the CSU Fort Collins BA in interdisciplinary liberal arts program take major core courses in the humanities, arts, social sciences, and languages. They also select a minor from seven options: business administration, sociology, anthropology, economics, media studies, political science, and gerontology. Online classes, delivered asynchronously, allow students to study whenever their schedules permit. Candidates must earn 120 credits to graduate, and this customizable degree typically takes four years of full-time study, but the degree time frame varies from student to student. The curriculum concludes with a capstone seminar, in which students demonstrate core competencies in researching, writing, and speaking while exploring theme-based topics related to liberal arts. Prospective students apply with high school or previous college transcripts. The program requires applicants to hold a GPA of 2.0 or better, but admission officers prefer GPAs of 2.5 or better. The university requires applicants who do not already hold bachelor's degrees to have advanced placement or higher educational course experience in mathematics, or take the Colorado State University Math Placement Exam. CSU Fort Collins works with transfer students to maximize the number of credits that can be transferred from other colleges, and guarantees transfer credit for candidates who hold associate degrees from Colorado community colleges. Colorado State University is regionally accredited by the Higher Learning Commission (HLC). University of Oklahoma - Norman ranks #8 on The 50 Best Online Bachelor's in Liberal Arts Programs! The University of Oklahoma in Norman, Oklahoma, offers a Bachelor's of Arts in Liberal Studies degree through OU Extended Campus. The degree helps students fulfill their career goals, and it can be completed 100% online. Believing that professional success comes from the ability to think critically in diverse roles, this degree program trains candidates to do in-depth research into various academic subjects while emphasizing the skills needed in liberal arts jobs, such as education, journalism and government administration. Advisors work with students to plan customized courses of study. The degree requires 120 credits of study in total. Accelerated classes allow candidates to complete the degree in fewer than four years, but students may progress at a pace that matches their individual schedules. After completing the university's general education requirements, students take major core courses in interdisciplinary inquiry strategies, humanities, social sciences and physical sciences. Candidates then take six classes from one of three concentrations: humanities, sciences or social sciences. They must also take two classes from a second concentration area of their choosing. The liberal arts degree curriculum culminates with capstone research projects developed by students and professors. Applicants to this program typically must hold at least 24 credits from OU or another regionally accredited higher educational institution. Candidates meeting this requirement apply with college transcripts and must prove a GPA of 2.0 or better. However, those who don't meet the requirement may be eligible to enter the program on a case-by-case basis and should apply with high school transcripts. The university also considers other qualifications, such as military experience. Transfer credit may be given for military training, and military personnel may qualify for tuition discounts. University of Northern Iowa ranks #9 on The 50 Best Online Bachelor's in Liberal Arts Programs! UNI, based in Cedar Falls, offers a customizable liberal arts degree online. This program provides a flexible alternative to traditional undergraduate degree options. Students work with advisors to develop courses of study tailored to their learning interests. This flexibility allows candidates to prepare for specialized graduate degrees or advance in professional roles. UNI's bachelor's of liberal studies program typically serves students who have already earned 60 college credits. The degree requires a total of 120 credits to complete, including credits transferred from other programs. Students can select semester-based classes or engage in self-paced guided independent studies up to nine months in duration. Total time to complete this degree therefore varies, but students typically graduate in four years total, with two years in this UNI program. Students choose to study topics in three of five concentration areas: humanities, communication and arts, natural sciences and math, social sciences, and professional fields. These concentrations afford ample class choices. Candidates can choose from hundreds of classes, including criminology, medical terminology, children's literature, nutrition, and statistical methods. Online classes, delivered asynchronously, allow students to study whenever their schedules permit. This program accepts all candidates who hold at least 60 credits from accredited higher educational institutions with a GPA of 2.0 or better. Prospective students apply with college transcripts. Students in this liberal studies degree must complete at least 30 credits at UNI at the junior and senior level. Although Iowa residents pay significantly less than non-residents for on-campus courses at UNI, resident and non-resident students typically pay the same tuition rates for the distance education classes required for this degree. The University of Northern Iowa is regionally accredited by the Higher Learning Commission (HLC). Rowan University ranks #10 on The 50 Best Online Bachelor's in Liberal Arts Programs! Rowan, based in Glassboro, New Jersey, offers a bachelor's in liberal arts online degree intended for working adults. The program allows candidates with previous college experience to complete their undergraduate studies and advance their careers. Rowan's liberal studies degree emphasizes philosophy and religious studies training to encourage students to develop critical and integrative reasoning skills. The degree also includes exposure to public relations and advertising topics, useful for honing the communication skills needed in many professional roles. The Rowan BA in liberal studies requires candidates to earn a total of 120 credits, with 39 credits in the major core. Major core classes include religions of the world, American philosophy, introduction to public relations and advertising research, and public opinion studies. Candidates can study as part-time or full-time students, completing the degree in as few as seven semesters. Rowan online students can access technology support services any time of day for help solving technical problems and getting advice about hardware and software requirements for online study. The university also offers regularly scheduled online learning symposiums, one-day seminars where teachers share advice about best practices for successfully delivering course content online. Students can benefit from attending these symposiums, as they explain how online classes function at Rowan. This liberal studies degree program accepts candidates with at least 24 higher educational credits and a GPA of 2.0 or better. Prospective students apply online with college transcripts. Rowan admits applicants three times a year, and students can begin their studies in fall, spring, or summer semesters. Rowan University is regionally accredited by the Middle States Commission of Higher Education (MSCHE). Regis University ranks #11 on The 50 Best Online Bachelor's in Liberal Arts Programs! Regis, headquartered in Denver, Colorado, offers an online liberal arts program that teaches marketable skills applicable to many professions. Designed for adult students, this degree encourages candidates to develop as critical thinkers who understand how social groups interact. The degree emphasizes written and oral communication skills. The Regis liberal arts degree helps students prepare for advanced roles in business and law office settings. Candidates must earn a total of 120 credits to earn the Regis liberal studies BA degree. Students complete 45 credits in general core classes that survey liberal arts subject areas, including humanities, global issues, social science, mathematics, science, philosophy, and religious studies. Students then take 18 credits in foundational courses that cover written and oral communication, research, and ethics. They then choose six more classes in any one of the general core subjects. The remainder of required credits come from electives or an optional minor focus, selected from the core subject offerings. The degree culminates with a capstone project, in which students review and apply interdisciplinary research techniques. Prospective liberal studies students apply with high school or college transcripts and personal statement essays. Regis maintains generous credit transfer policies to accommodate students who began their undergraduate careers elsewhere. The university often grants college credit for military training, professional licenses, and work experience. Regis helps students reach their professional goals with a dedicated career and professional development center. Career counselors work with students to develop resumes and portfolios, practice interviewing skills, and learn networking strategies. The university maintains close relationships with top employers in the region, and helps connect graduates with job opportunities. Regis University is regionally accredited by the Higher Learning Commission (HLC). Northern Arizona ranks #12 on The 50 Best Online Bachelor's in Liberal Arts Programs! NAU, located in Flagstaff, offers two related liberal studies online degrees. Both allow students to personalize their courses of study, and draw on the arts, history, literature, and philosophy to teach the skills necessary to engage in meaningful interdisciplinary research. Students in these programs learn to analyze and evaluate ideas and participate in the kinds of collaborative communication employers look for in leaders. Both liberal studies degrees emphasize international issues, and students learn to compare perspectives from different cultural viewpoints. Online students at NAU can access technology support services at all hours. Online tutoring experts help students who feel they could benefit from extra instruction. The university's library gives students access to academic journal databases they need to conduct research while enrolled in NAU. Both the BA and BS in liberal arts at NAU require students to complete 120 total credits. All liberal arts degree candidates learn core competencies, such as effective written and oral communication, research methods, and complex problem-solving. Students choose major course classes that match their interests. Available courses include art history, cinema, world history, sociology, and criminology. Students on the BA track also take classes in modern languages. Candidates on the BS track instead take science classes covering topics such as astronomy, technology, and water management. Incoming freshmen apply with high school transcripts showing a GPA of 2.5 or better and ACT or SAT scores. Those who have earned at least 12 credits elsewhere may apply as transfer students, and must submit college transcripts. Transfer students normally must demonstrate a GPA of at least 2.0. Liberal arts students must also take readiness assessments to make sure they can handle accelerated personal learning options available in this course of study. Northern Arizona University is regionally accredited by the Higher Learning Commission (HLC). Brandman University ranks #13 on The 50 Best Online Bachelor's in Liberal Arts Programs! Brandman, based in Irvine, California, offers an online liberal studies degree specifically for educational professionals. This program prepares teachers to teach multiple subjects, and includes subject areas commonly taught in California elementary schools. Courses emphasize Common Core and California state educational standards, and help educators prepare to qualify for state teaching credentials. Brandman's bachelor's of arts in liberal studies, multiple subjects teaching degree requires candidates to complete 51 credits in core classes. Educational foundations classes explore issues pertaining to education and society and educational technology. Subject matter courses cover language arts, natural sciences, mathematics, performing arts, history and social science, and child development. Students also complete liberal studies capstone projects, in which they demonstrate their interdisciplinary research skills. The university supports student success with dedicated resources. Enrollment coaches help prospective students plan courses of study and complete applications. Academic advisors make sure students achieve their educational goals and complete degrees as efficiently as possible. Writing and math tutors provide academic support for students that seek additional instruction. Career counselors guide students as they search for jobs relevant to the degrees they earn at Brandman. This Brandman liberal studies program typically accepts candidates with at least 12 credits from other colleges. Applicants must provide college transcripts proving a GPA of 2.0 or better. Those without previous college experience may apply with high school transcripts, and make up the 12 credits at Brandman needed for full acceptance to the program. Brandman accepts transfer credit from regionally accredited institutions, and grants up to 46 hours of credit for candidates with extensive military training. Brandman University is regionally accredited by the WASC Senior College and University Commission. University of Iowa ranks #14 on The 50 Best Online Bachelor's in Liberal Arts Programs! The University of Iowa, based in Iowa City, offers a respected online liberal arts degree. This program, designed for working adults, helps students develop the skills needed in professional leadership roles. The degree emphasizes critical thinking and effective verbal and written communication, and teaches students to consider complex issues from multiple perspectives. The university provides ample services to help online liberal studies students succeed. Writing and math labs assist students needing extra academic support, while career counselors help students find job opportunities relevant to their educational experiences and career goals. The University of Iowa's bachelor's of liberal studies degree requires candidates to earn 120 credits to graduate, which typically translates into four years of full-time study. All students in this program complete core courses covering rhetoric, leadership, critical thinking, science, and information literacy. Students then select concentration areas, writing and self-expression, family and community services, global studies, health, justice, and organizational structures. To ensure they receive broad educational experiences, students must take classes in three of five distribution areas: humanities, communication, science and math, social sciences, and professional fields. Candidates must maintain a GPA of 2.0 or better to graduate. This program typically caters to adult students with prior college experience. Candidates typically have at least 24 credits from other institutions, and may apply up to 60 transfer credits to this degree. Applicants must prove a GPA of 2.0 or better. The program typically requires candidates to have completed high school at least three years prior to admission, but waives this requirement for applicants who already hold associate degrees. The University of Iowa is regionally accredited by the Higher Learning Commission (HLC). Northwestern State University of Louisiana ranks #15 on The 50 Best Online Bachelor's in Liberal Arts Programs! NSU, based in Natchitoches, offers a bachelor's of liberal arts degree that allows candidates to explore topics related to social science and human behavior. The degree emphasizes written and verbal communication skills, and trains students to take international perspectives on complex issues. NSU helps liberal studies online degree students succeed with relevant support services. Academic advisors help students plan the most efficient ways to complete degrees and achieve personal learning goals, while tutors provide extra instruction for students who need additional academic assistance. Career counselors help students locate professional development resources and translate their university experiences into rewarding careers. The university's service learning office partners with community organizations to develop projects through which students can gain valuable experience addressing complex social challenges. Candidates in NSU's liberal arts program must earn 120 credits to graduate. Students study communication, arts, English, science, math, and a foreign language as major core subjects. They then opt to concentrate in performing arts, entertainment technology, ethnoarchaeology, geography, international relations, or social issues. Students may also choose to minor in anthropology, geography, or global studies. The entire program typically takes four years. First-year freshmen apply with high school transcripts and ACT or SAT scores. Those with previous higher educational experience must provide college transcripts to apply. The university accepts transfer credit from other regionally accredited institutions. NSU often grants transfer credit through testing. Incoming transfer students can also earn credit through prior learning assessments, developed in special writing-intensive courses where students highlight relevant work, life, or volunteer experiences. The Northwestern State University of Louisiana is regionally accredited by the Southern Association of Colleges and Schools Commission on Colleges (SACS). Bowling Green State University ranks among The 50 Best Online Bachelor's in Liberal Arts Programs! BGSU, based in Bowling Green, Ohio, offers a flexible online liberal studies degree. Students work with advisors to develop academic plans that match learners' interests and professional goals. This program caters to students with previous college experience who want to finish their degrees through personalized courses of study. Candidates can attend all required classes online, making the degree ideal for busy working professionals. BGSU supports student success with dedicated academic advisors, tutoring services, and technical support staff. Career counselors help match liberal studies students with jobs that utilize the skills they develop while at BGSU. The bachelor's of liberal studies at BGSU requires candidates to earn 122 credits in total. Students complete the university's core curriculum requirements by taking natural sciences, social sciences, humanities, writing, and quantitative literacy courses. Liberal studies majors then select electives that allow them to concentrate on subjects they deem most relevant to their career goals. However, the liberal studies program encourages students to develop broad academic foundations, and candidates for this degree can take no more than 27 credits in any one discipline. This program typically requires candidates to hold at least 60 credits from another higher educational institution, and applicants must supply transcripts from previously attended colleges. Candidates must prove a GPA of 2.0 or higher. The liberal studies program also requires prospective students to send personal essays that describe why a liberal arts approach matches their short-term and long-term goals. BGSU accepts transfer credits from all accredited institutions. The university also grants college credit through examination and for military training. Bowling Green State University is regionally accredited by the Higher Learning Commission (HLC). Thomas Edison State University ranks among The 50 Best Online Bachelor's in Liberal Arts Programs! TESU, located in Trenton, New Jersey, hosts an online liberal arts program that helps students advance their careers, change professional fields, or prepare for specialized graduate degrees. This degree emphasizes multidisciplinary approaches and requires students to choose at least two different areas of academic focus. The university supports online liberal arts students with academic and financial advisement, and maintains relationships with top employers in the region to facilitate career opportunities for program graduates. This bachelor's of arts in liberal studies program requires candidates to earn a total of 120 credits. All students in this program learn written and oral communication skills, information literacy, quantitative literacy, social sciences, and ethics and civic engagement. Students then select primary and secondary degree concentrations. They can opt to study communications, computer science, criminal justice, general management, healthcare management, health and wellness, human resources, humanities, labor studies, natural sciences and mathematics, psychology, or social sciences. Degree candidates then complete integrated capstone projects in which they apply interdisciplinary approaches to the research areas they select in collaboration with professors. The university typically only accepts incoming freshmen aged 21 or older, but makes exceptions in some cases. Applicants submit high school or college transcripts, and typically do not need to provide standardized test scores. With 12 application deadlines throughout the year, students can begin their courses of study at the time that makes the most sense for them. TESU accepts transfer credit from all regionally accredited higher educational institutions. The university also grants transfer credits for military training, professional licensure, and by exam. Thomas Edison State University is regionally accredited by the Middle States Commission of Higher Education (MSCHE). Excelsior College ranks among The 50 Best Online Bachelor's in Liberal Arts Programs! Excelsior, located in Albany, New York, offers four liberal arts degrees to prepare graduates for different kinds of liberal arts degree jobs. The BA in liberal arts track without a concentration allows students to sample courses from various subject areas. This option helps those with previous college experience finish their undergraduate degrees as efficiently as possible. The BS in liberal arts with a concentration in logistics prepares professionals in fields related to global supply chain management. The BS in liberal arts with a public health concentration produces well-rounded graduates able to take interdisciplinary approaches to public health challenges. The BS in liberal arts professional and technical writing concentration helps students learn skills needed in writing-intensive fields, such as government agencies, science industries, and medical fields. All Excelsior liberal arts degrees require students to earn 120 total credits and maintain a GPA of at least 2.0. Students take classes in the humanities, social sciences, and math and science relevant to their learning goals. They also take classes that teach writing and information literacy skills. Students then complete specialized classes in their chosen concentration areas or, for BA candidates opting not to declare concentrations, continue to explore elective courses. Prospective students without higher educational experience apply with high school transcripts. Transfer students submit transcripts from all colleges previously attended. Excelsior encourages all applicants to complete FAFSA forms, as these help admissions officers locate funding opportunities for incoming students. Excelsior accepts transfer credits from regionally accredited institutions. The college also grants university credit for some kinds of military training, professional certifications, and by exam. Excelsior College is regionally accredited by the Middle States Commission of Higher Education (MSCHE). Syracuse University ranks among The 50 Best Online Bachelor's in Liberal Arts Programs! Syracuse University in upstate New York offers distance learners an online liberal arts degree through its college of arts and sciences. The bachelor's of arts in liberal studies gives students a general education, spanning the humanities, social sciences, natural sciences, and mathematics. Graduates leave the program equipped with critical thinking skills, a greater understanding of themselves, and knowledge related to global cultures and the environment. In addition to a fully online program, students can choose a hybrid program with in-person components as well as accelerated and weekend options. Applicants must submit their transcripts and hold a high school diploma or GED certificate. College transfer students must have a minimum 2.5 GPA. Students also need to complete an interview with an advisor, which can take place over the telephone. Under certain circumstances, the admissions committee may request that applicants submit letters of recommendation. Students must complete 120 credits to graduate with a BA in liberal studies from Syracuse. The school's generous transfer policy allows distance learners to transfer up to 90 credits towards their degrees, including up to 66 credits from a junior college. To count towards degree requirements, transfer credits must have been earned at an accredited college or university with a ‘C' grade or better. This program requires students to fulfill three different areas: liberal skills, divisional perspectives, and depth. Distance learners also take 24 credits of free electives in any area of academic interest. Required coursework includes a six-credit writing studio, a three-credit intensive writing class, and two courses tackling critical reflections on ethical and social issues. Syracuse University is regionally accredited by the New England Association of Schools and Colleges (NEASC-CIHE). Columbus State University ranks among The 50 Best Online Bachelor's in Liberal Arts Programs! Students interested in pursuing liberal arts-related work can earn a BA in liberal arts from Columbus State University in Georgia. This degree can be completed entirely online with no in-person requirements. Students pursuing this online degree choose from three tracks: humanities and social science, military and global issues, or philosophy. The military and global issues track typically appeals to members of the military and veterans, although it is open to everyone. The overall program provides learners with a broad and interdisciplinary education, while the different tracks allow students to narrow their study to a specific area. Subjects covered by the degree include philosophy, economics, sociology, foreign languages, theater, art, and English. Graduates learn to effectively use the tools of oral and written communication to express ideas, solve problems, and contribute within a community of learners. There are not any program-specific admissions requirements for the bachelor's of arts in liberal studies program at Columbus State. However, applicants must meet the general university requirements for acceptance. To graduate with a BA in liberal arts, students complete 123 credits. Available liberal arts courses include seven revolutions in global change, historical perspectives on the philosophy of science and mathematics, and introduction to creative nonfiction writing. The program typically takes four years of full-time study to complete. Students must also complete a capstone portfolio, which synthesizes what they learned over the course of the program. Columbus State University is regionally accredited by the Southern Association of Colleges and Schools Commission on Colleges (SACS). Bay Path University ranks among The 50 Best Online Bachelor's in Liberal Arts Programs! Bay Path University, located in Longmeadow, Massachusetts, offers an online liberal arts degree. The American Women's College at Bay Path offers a bachelor's of arts in liberal studies degree entirely online, with no on-campus requirements. Designed for adult women who have other responsibilities, including family and work obligations, this program gives students the freedom to design an academic program to suit their needs and schedule. This degree prepares graduates to continue advanced academic study or pursue liberal arts jobs. Critical thinking, problem solving, and advanced literacy represent a few of the skills gained by graduates of this program. The program offers its asynchronous classes in an accelerated, six-week format, letting students earn their degrees on their own time in as little as one year. Six different start dates make it easier to fit the program into a busy schedule. Although students can earn their degrees entirely online, they also have the option of of taking on-campus Saturday courses if they live near one of the school's two Massachusetts locations. Distance learners can pursue this liberal studies degree either part-time or full-time. Students transferring from another school may apply up to 90 credits towards their BA. They can also receive credit for military service and work or volunteer experience. Distance learners at Bay Path gain access to educator coaches who give students individualized attention. Additionally, the school's Social Online Universal Learning (SOUL) program helps adult online learners succeed. The university charges distance learners a flat tuition rate, regardless of their state of residence. Endicott College ranks among The 50 Best Online Bachelor's in Liberal Arts Programs! Endicott College in Beverly, Massachusetts offers distance learners the opportunity to earn a liberal arts degree online. Its bachelor's of arts in liberal studies program provides students with a broad understanding of the arts, social sciences, humanities, and natural sciences. Designed for individuals seeking ample freedom to create their own course of study, this BA take a multidisciplinary approach and emphasizes problem solving and communication skills. Students pursuing a BA in liberal studies choose from four areas of concentration: early childhood education, Montessori education, or trauma studies. The early childhood education concentration requires students to complete eight courses (24 credits) and is designed for individuals who intend to work as teachers in pre-K centers. The homeland security studies concentration requires six courses (18 credits) and teaches students the skills needed to work in emergency management, security, and border patrol. The concentration in Montessori education benefits teachers who use the Montessori method and consists of six courses (18 credits). Finally, the trauma studies concentration features six courses (18 credits) and instructs students how to help individuals suffering from trauma in clinical and social work settings. To graduate with a BA in liberal studies from Endicott, students must complete a total of 42 courses (126 credits), including classes like global issues, social impact of the media, introduction to gender studies, and aesthetic awareness. At the end of the program, each student undertakes a personal project in a capstone course, where they engage in intensive study about a topic relevant to their personal goals and area of specialization. Endicott College is regionally accredited by the New England Association of Schools and Colleges (NEASC-CIHE). California Baptist University ranks among The 50 Best Online Bachelor's in Liberal Arts Programs! California Baptist University, in the city of Riverside, boasts a bachelor's of arts in liberal studies that is available to distance learners. The program provides students with a well-rounded education while emphasizing multiculturalism; individuals interested in a teaching career may find it particularly relevant. The multidisciplinary curriculum of this liberal studies degree fosters communication skills and critical thinking, exposing students to a variety of teaching styles and issues related to diversity. The coursework also reflects the Christian values held by the university. Graduates of CBU's program gain the skills needed to work in a variety of liberal arts degree jobs or to continue their studies at the graduate level. In addition to general education requirements, students complete 49 credits within the liberal studies core, including courses such as the history of California, integrated humanities, and minorities in America. Students also choose from one of four concentrations: social science, English, human development, or kinesiology. Individuals take 12 credits in their concentration of choice. Depending on which concentration a student selects, courses may include multicultural literature, cognitive development, lifelong motor development, and non-western culture and history. All students also complete a capstone portfolio as a culminating experience. To be admitted to the program, applicants must hold a high school diploma or 24 transferable college credits. On average, students complete the program in 18 months. Financial aid opportunities for online students at CBU include grants, loans, veteran benefits, financing plans, and employer tuition assistance. University of Wisconsin - Oshkosh ranks among The 50 Best Online Bachelor's in Liberal Arts Programs! Distance learners searching for an online liberal arts program can pursue a bachelor's of liberal studies at the University of Wisconsin-Oshkosh. This 100%-online program follows an accelerated format, with most courses offered in seven-week sessions. The curriculum emphasizes developing communication and critical thinking skills. UW-Oshkosh's liberal studies degree represents a good choice for students who want to explore many different academic fields; it also prepares individuals to further their education and go on to attend graduate school. Distance learners who already hold an associate degree in liberal studies, as well as those with no previous college credit, can apply to the program. Online students do not need to submit their ACT or SAT scores. Transfer students must have a minimum 2.0 GPA. Full-time students who already hold an associate degree in liberal studies usually complete the program in about two years. UW-Oshkosh's flat-rate tuition makes it easier for students to budget for their education, and online learners qualify for numerous financial aid opportunities, including employer tuition discounts. To graduate, students must earn 120 credits, although up to 90 of these credits can be transferred into the program. Requirements include 44 general education credits, 21-24 liberal studies core credits, and nine liberal studies elective credits. Core courses in this liberal studies bachelor's degree include transformative leadership, development of scientific ideas, and conflict resolution. Liberal studies majors also take a capstone seminar, senior research seminar, and senior project course before graduating. Anderson University ranks among The 50 Best Online Bachelor's in Liberal Arts Programs! Students looking for schools that offer a liberal arts degree online can earn a bachelor's of liberal studies at South Carolina's Anderson University. This program allows distance learners to work with an academic advisor to design a course of study that fits a student's interests and career goals. Learners study core fields of the humanities, social sciences, and business. Ideal for students who want a well-rounded, multidisciplinary education, a bachelor's of liberal studies from Anderson prepares graduates to work in a variety of industries or pursue further education at the graduate level. Anderson offers two options for those interested in its liberal studies bachelor's: a degree-completion program for individuals who already hold an associate degree in liberal studies and an option for those without a degree. To earn this degree, students complete 120 credits; up to 64 of these credits may be brought into the program as transfer credits. Students complete 36 general education credits, 12 core credits, 36 credits with a liberal studies emphasis, and additional electives as needed. The program delivers courses in accelerated, eight-week sessions. Specific classes required for this degree include a senior seminar in liberal studies, a survey of world music, and a financial management course. All students at Anderson also complete two courses (for a total of six credits) in Christian studies: introduction to the Bible and Christian worldview and contemporary application. Anderson University is regionally accredited by the Southern Association of Colleges and Schools Commission on Colleges (SACS). Westfield State University ranks among The 50 Best Online Bachelor's in Liberal Arts Programs! Massachusetts' Westfield State University offers an online liberal arts program for distance learners. This bachelor's in liberal studies is a degree-completion program for individuals who already have an associate degree in liberal studies or two years of college credit. Online courses follow Westfield's traditional on-campus academic calendar with 15-week fall and spring semesters, a two-week winter session, and two, six-week summer sessions. The liberal studies degree gives students a broad education, preparing them for careers across many industries. The bachelor's in liberal studies also represents an excellent companion major for students enrolled in teacher licensure programs. Westfield's interdisciplinary liberal studies degree gives students the freedom to customize their course of study to reflect their academic interests. Academic advisors help distance learners design a degree plan, and students can earn either a BA or BS in liberal studies. Both degree tracks require enrollees to select three concentration areas to create a coherent course of study. Students pursuing the BA option choose three concentrations in the liberal arts, whereas BS in liberal studies students choose concentrations from two professional fields (e.g., economics and management, computer science, and criminal justice) and one liberal arts discipline (e.g., gender studies or ethnic studies). To graduate, students must complete 120 credits. In addition to fulfilling the university's general education common core requirements, students take 18 credits in a primary concentration, 15 credits in a secondary concentration, and 12 credits in a third area of concentration. Students take liberal arts electives to fulfill any remaining credit requirements. The New School ranks among The 50 Best Online Bachelor's in Liberal Arts Programs! Distance learners interested in obtaining a liberal studies online degree can pursue a BA or BS in liberal arts at the New School's public engagement school in New York City. The entire degree can be completed online, or students can take a combination of online and on-campus courses. Designed for adults and transfer students who often have work experience and have taken time off between high school and college completion, the program lets individuals create their own multidisciplinary course of study. The program accepts up to 84 transfer credits towards the undergraduate degree, including credit for college-level learning received from work and life experience. The Bachelor's degree in Liberal Arts requires students to complete 120 credits. The online program can be entirely self-designed, giving students the freedom and flexibility to tailor their degrees to meet their unique needs and interests. Students will choose from an array of subjects and disciplines to study, including media studies, business, creative writing, food studies, and psychology. Students may study part-time or full-time. Online classes are asynchronous - students and instructors are not required to all be engaged at the same time. In addition to the flexible degree program, students can also declare a minor or pursue an accelerated Bachelor's-Master's pathway. Online students may also have opportunities to pursue study abroad, internship, and independent study. The New School is regionally accredited by the Middle States Commission of Higher Education (MSCHE). 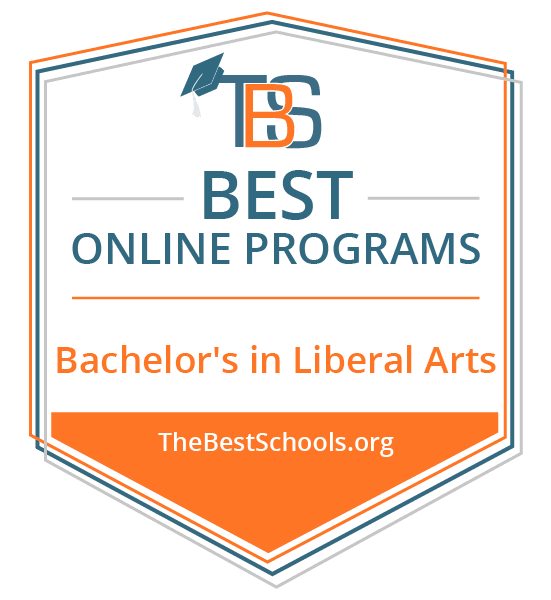 Los Angeles Pacific University ranks among The 50 Best Online Bachelor's in Liberal Arts Programs! Los Angeles Pacific University, located in Southern California, offers an online bachelor's in liberal arts. LAPU designed this bachelor's of arts in liberal studies for students working to become special education and elementary school teachers. The accelerated program prepares students for successful teaching careers by providing them with a multidisciplinary academic background. Many working paraprofessional educators enroll in the program to further their careers. The entire degree is available online, with no in-person requirements. As an evangelical, faith-based institution, LAPU integrates Christian values into its curriculum. Students complete 120 credits to graduate with a bachelor's degree, with 73 general education credits and 47 credits from the liberal arts core. Additionally, online students benefit from discounted, flat-rate tuition. Core classes in the liberal arts curriculum explore the arts, sciences, history, mathematics, communications, human development, and ethics. Students also have the option of adding an English concentration to their degree, which requires them to complete 12 English credits in composition, children's literature, and language principles and processes. Admission to the program requires a minimum 2.0 GPA and submission of high school and/or college transcripts. Some candidates with lower GPAs may be provisionally admitted if students demonstrate competence in an alternative way. Up to 90 transfer credits may be accepted from a four-year school and up to 60 credits may be transferred in from a two-year school. Students can also earn credit for prior learning based on their work, volunteer, or military experiences. Los Angeles Pacific University is regionally accredited by the WASC Senior College and University Commission. Saint Leo University ranks among The 50 Best Online Bachelor's in Liberal Arts Programs! Distance learners can enroll in a liberal arts program online through central Florida's Saint Leo University. The school's bachelor's of arts in liberal studies programs emphasizes communication, analytical, and computer literacy skills. It draws from multiple disciplines, including the humanities, arts, social sciences, natural sciences, business, and quantitative reasoning. The value of leadership is also an important component of the program. To graduate, students complete 120 credits, including 36 core liberal arts credits from classes that include a survey of major writers of the 20th century, environmental studies: creating sustainable societies, and cultural anthropology. All students at this Catholic institution also complete six credits of religious study, with course options like Christian spiritual vision. One of the first schools in the U.S. to offer online learning, Saint Leo provides numerous tools to distance learners. Its student life department connects learners with virtual student clubs, social media networking, and online graduation coordination, while the career services professionals at Saint Leo offer career planning, mock interviews, resume assistance, and webinars. The school's academic advisors benefit from extensive experience working with online adult learners and help students select courses and stay on track to graduate. Online classes start six times each year, with two terms each spring, summer, and fall. To be admitted into the program, applicants need a high school diploma or GED certificate. Applicants with previous college experience must also submit those transcripts. Wilmington University ranks among The 50 Best Online Bachelor's in Liberal Arts Programs! Wilmington University in New Castle, Delaware offers a liberal studies online degree-completion program. Students who already have some college credit can transfer into this program and earn a bachelor's degree. To be eligible, students need a minimum of 30 transfer credits, although they can apply up to 90 credits toward their degree. The bachelor's of science in liberal studies provides a well-rounded education. Areas of specialized study include business applications, public speaking, critical thinking, and psychology. The program also emphasizes technological literacy and social responsibility. Students can complete the degree entirely online without ever setting foot on campus. The curriculum includes 24 credits in the liberal studies core, 39 general education credits, and 57 elective credits. Wilmington encourages students to pursue minors and certificates while fulfilling their elective credit requirements. Core liberal arts courses include research writing, inferential statistics, financial literacy, and a senior seminar. Students also take six credits of cooperative education, which provides them with practical experience working at a company of their choosing. Students must complete 60 credits and have a minimum 2.5 GPA before they undertake the cooperative education experience. Wilmington's open admissions policy invites all interested applicants to apply to the liberal studies BS program. Support for distance learners includes tutoring, library resources, academic advising, and technical support. Wilmington's asynchronous courses come in seven- or 15-week sessions. Wilmington University is regionally accredited by the Middle States Commission of Higher Education (MSCHE). SUNY College at Brockport ranks among The 50 Best Online Bachelor's in Liberal Arts Programs! Distance learners can earn a bachelor's in liberal arts online at SUNY College at Brockport. The State University of New York (SUNY) represents the largest system of universities in the country. Students can enroll in a degree-completion program to earn either a bachelor's of arts or bachelor's of science in liberal studies. To be eligible for the program, applicants must have already earned at least 60 college credits. The entire program is available online, with no in-person components. SUNY advisors work with distance learners to create an individualized plan of study that meets general university and major requirements. The liberal studies major incorporates curriculum from a variety of disciplines, including social sciences, mathematics, the humanities and arts, and natural sciences. Each student also selects an individualized area of research to focus on while they pursue their degree. The 120-credit degree includes 27 credits of required liberal arts classes. General education coursework and electives make up the remainder of the credit requirements. Core liberal arts courses include five seminars and several research-focused classes. Two required courses focus on integrating the different fields that comprise liberal arts. Some of the liberal arts core courses are available as online classes, while others consist of independent study experiences where students work individually with their professors to create a plan of study. Distance learners also have the opportunity to participate in internships, research, and fieldwork experiences. SUNY College is regionally accredited by the Middle States Commission of Higher Education (MSCHE). Utah State University ranks among The 50 Best Online Bachelor's in Liberal Arts Programs! Utah State University, in the city of Logan, offers an online liberal studies degree to students who already have some college experience. Applicants need at least 45 credits with a minimum 2.5 GPA to be eligible for admission into the liberal arts program. This degree is delivered by Utah State's department of languages, philosophy, and communication studies. The 100%-online bachelor's of arts in liberal arts provides students with a broad education, focusing on the political process and institutions, development of civilizations, literature and fine arts, and cultural/historical traditions. Graduates improve their communication, problem solving, and critical thinking skills, becoming desirable employees for a range of industries or excellent candidates for graduate school. Working one-on-one with an academic advisor, online students develop their own individualized course of study with a focus on the arts, humanities, and social sciences. Utah State strongly recommends that liberal arts majors also pursue a second major, certificates, or minors to increase their future opportunities. To graduate, students must complete 120 credits. Online liberal arts courses include a variety of subjects, from feminist theory in the arts to the cultural history of German speaking people to design in everyday living. Distance learners at Utah State benefit from several student services, including academic advising, a career services office, e-tutoring, IT remote help, financial aid counseling, library resources, a women's center, software discounts, and a disability resource center. North Carolina A&T State University ranks among The 50 Best Online Bachelor's in Liberal Arts Programs! North Carolina A&T State University in Greensboro hosts a bachelor's of arts in liberal studies program for distance students interested in enrolling in a liberal arts program online. The school designed this degree for learners who want to pursue careers related to their specific concentration within the larger context of the humanities, education, and public administration. Graduates also gain a strong educational foundation that prepares them to go on and earn a graduate degree. Students choose from four different concentration areas: African American studies, applied cultural thought, cultural studies, or women's studies. Students take core liberal arts courses in subjects that include foreign languages, scientific reasoning, and global learning. All senior liberal arts majors take a final senior seminar/capstone course. Applicants must fulfill the admissions criteria for general university admission to North Carolina A&T, but there are no program-specific admissions requirements. The entire bachelor's degree can be earned online, with no required in-person sessions. Most courses last 16 weeks. Online learners benefit from the assistance of a liberal arts program coordinator, career services, and financial aid opportunities. Students must complete 124 credits to earn a BA in liberal studies. This includes 30 credits of concentration classes and nine credits of core liberal arts courses. The three required core classes include introduction to liberal studies, research methods in liberal studies, and a senior research project. Students must earn a ‘C' or better in all concentration and core courses to graduate. North Carolina A&T State University is regionally accredited by the Southern Association of Colleges and Schools Commission on Colleges (SACS). Northwest Nazarene University ranks among The 50 Best Online Bachelor's in Liberal Arts Programs! Students looking to pursue a liberal arts bachelor's degree online may be interested in attending Northwest Nazarene University. With a main campus in Nampa, Idaho, this nonprofit, Christian university boasts more than 60 areas of study at the undergraduate and graduate levels. It is one of eight American universities affiliated with the Church of the Nazarene. Its fully online liberal arts program gives students the flexibility to continue working while furthering their education. Classes start every eight weeks, and learners have the option of studying either part-time or full-time. Online tuition costs the same, regardless of a student's residency status, and online learners may qualify for a variety of financial aid options. NNU's liberal arts program emphasizes a broad understanding of human knowledge and encourages intellectual curiosity, moral responsibility, and independent thinking skills. Students choose from three areas of emphasis: humanities, social science, or mathematics and science. Degree requirements include 24 credits in their area of emphasis and 18 credits each in the two other liberal arts areas. Online learners receive support in the form of library resources and career services. NNU also invites online students who live near campus to participate in athletic events, attend chapel services, and take advantage of the campus recreation center. Transfer students can receive credit for up to 62 semester credits from a two-year school. The number of credits accepted from a four-year accredited school is unlimited, but students must complete a minimum of 24 credits at NNU; of these, at least eight must be upper-division credits in the major. Northwest Nazarene University is regionally accredited by the Northwest Commission on Colleges and Universities (NWCCU). University of Massachusetts-Dartmouth ranks among The 50 Best Online Bachelor's in Liberal Arts Programs! The University of Massachusetts-Dartmouth offers a fully online liberal studies degree. Students can complete the entire curriculum online without ever going to campus. The bachelor's of arts in liberal arts focuses on turning students into effective communicators and critical thinkers. Applicants with no previous college experience, as well as those with substantial college credit, can enroll in UMass Dartmouth's bachelor's of liberal arts program. To earn this BA degree, students must successfully complete 120 credits. The school's generous transfer policy lets individuals with previous college experience transfer up to 75 credits from a regionally accredited school. Distance learners choose two concentrations from the following options: women's and gender studies, urban studies, economics, history, English literature and criticism, philosophy, sociology and anthropology, and political science. Specific available courses include American fiction since 1945, world civilizations, sociology of food, and philosophy of happiness. Graduates of the liberal arts program can find work in a variety of careers, including social work, law, human resources, and sales. Many liberal arts majors also go on to pursue further study at the graduate level. UMass Dartmouth offers many resources for distance learners, such as a career development center, an e-library, e-tutoring, academic advising, financial aid, technology support, and veteran services. Additionally, the school's Center for Access and Success helps students with disabilities succeed in the online learning environment. The University of Massachusetts is regionally accredited by the New England Association of Schools and Colleges (NEASC-CICHE). Oral Roberts University ranks among The 50 Best Online Bachelor's in Liberal Arts Programs! Distance learners can pursue a liberal arts bachelor's degree online at Oral Roberts University This Tulsa, Oklahoma institution is an interdenominational Christian university with a Christ-centered educational perspective. The school designed its bachelor's of science in liberal studies for students interested in pursuing several areas of study rather than narrowing their focus to a single topic. The program includes a degree-completion option for students who already hold a substantial number of college credit in two or three different subjects. The entire curriculum for this degree can completed online. The multidisciplinary liberal studies curriculum draws from the social sciences, biological and physical sciences, arts, and humanities. Liberal arts majors choose two or three areas of emphasis from the liberal studies curriculum. Individuals must also complete a senior paper or senior project in an area of emphasis. If students choose two emphasis areas (as opposed to three), they take extra electives to make up the additional credits. Each learner's individually designed plan of study must receive approval from the chair of the history, humanities, and government department. Students complete 128 credits to earn their BS in liberal studies. This includes 54 general education credits, 63 major credits, and five to 11 elective credits. Of the 63 major-area credits, at least 45 must be obtained through upper-division coursework. All students at Oral Roberts also take six credits in biblical literature and a three-credit theology course. Oral Roberts University is regionally accredited by the Higher Learning Commission (HLC). University of Wisconsin Whitewater ranks among The 50 Best Online Bachelor's in Liberal Arts Programs! UW-Whitewater offers BA and BS degrees in liberal studies online. In addition to choosing the type of degree, students can pursue the major as a 54-credit program with a focus area or as a 36-credit program with a minor. Students take courses in areas such as context, skills, and content, and can undertake an optional internship or study abroad experience. The online liberal arts degree is offered as a degree completion program, which means most applicants have completed general education courses or earned an associate degree. However, applicants without previous college experience can complete requirements at UW-Whitewater's campus or online through UW Colleges. Online students are eligible for the same financial aid as on-campus students, including scholarships, loans, and grants. Tuition includes textbook rental fees. Applicants should submit high school and college transcripts. Transfer applicants, with at least 12 college credits, must have a minimum GPA of 2.0 or must submit standardized test scores. Online students have access to on-campus services including the center for students with disabilities, university health and counseling, and career services. Career resources include career planning, cover letter development, and assistance with interviewing and graduate school applications. University of Wisconsin is regionally accredited by the Higher Learning Commission (HLC). Eastern New Mexico University ranks among The 50 Best Online Bachelor's in Liberal Arts Programs! ENMU offers more than 30 online programs, including a BAAS with a concentration in liberal arts. The 30-credit concentration includes coursework in history, political science, psychology and sociology, and religion. Half the credits are prescribed, and half comprise upper-level electives in the field. Online courses are delivered through Blackboard and Mediasite. Applicants must hold an associate degree from an accredited institution. The BAAS requires a primary and secondary concentration; the primary concentration is typically fulfilled by the associate degree, and students earn the secondary concentration at ENMU. Most students complete the program in two years. ENMU also offers 12 online minors. While completing the liberal arts program, online students have access to the library, the online writing center, an online counseling program, and the campus bookstore. Many courses are offered asynchronously, and students can access course materials 24/7. Tuition is charged per semester for students taking 12 to 18 credits and per credit for those taking fewer. New Mexico residents pay lower tuition rates than out-of-state students, though students in some western states are eligible for a Western Undergraduate Exchange waiver, which reduces out-of-state tuition. All prospective students who reside outside New Mexico should check ENMU's state authorization for distance learners, as the institution is not authorized to provide online education to students in every state. Eastern New Mexico University is regionally accredited by the Higher Learning Commission (HLC). University of Alaska Southeast ranks among The 50 Best Online Bachelor's in Liberal Arts Programs! UAS has campuses in Juneau, Ketchikan, and Sitka, Alaska, and offers an online bachelor's of liberal arts. The 120-credit online liberal studies degree requires at least 60 credits in the liberal arts major, 45 of which must be earned through UAS. Students also complete a three-credit capstone course. Of the 60 required liberal arts credits, 18 are in core courses and 42 are in emphasis courses. Core courses include an orientation class and a portfolio class, both of which students must complete within three semesters of enrolling. Both courses help students plan their course of study, and the portfolio is used for assessment as students progress through the program. Minimum admissions requirements include 24 credits completed at the 100 level or higher and specified math, statistics, and writing courses. The degree is ideal for transfer students, including those with associate degrees. First-time freshmen applicants must submit SAT or ACT scores, and transfer applicants should have at least a 2.0 GPA. Students who do not meet minimum admission standards may be admitted on probation. University of Alaska is regionally accredited by the Northwest Commission on Colleges and Universities (NWCCU). University of Toledo ranks among The 50 Best Online Bachelor's in Liberal Arts Programs! UT's online bachelor's in liberal arts program is designed for working professionals. The program develops critical thinking and writing skills and requires coursework in social and natural sciences and the humanities. Students complete an electives concentration, which consists of nine concentration credits and a related four-credit senior thesis. Applicants must be at least 25 years old, and transfer students must have a minimum 2.0 GPA. The university offers several types of scholarships; 85% of new students receive financial assistance. Transfer scholarships are open to students who have completed at least 12 credits. Transfer scholarships are based on GPA and range from $1,000 to $4,000, with out-of-state transfer scholarships available in higher amounts. Eligible out-of-state students may receive out-of-state tuition waivers. Online students have access to a student success coach, academic advisors, disability services, counseling, and career services. Academic support includes online tutoring, the online library, and IT assistance. Online courses are delivered synchronously and asynchronously through Blackboard. The University of Toledo is regionally accredited by the Higher Learning Commission (HLC). Southern New Hampshire University ranks among The 50 Best Online Bachelor's in Liberal Arts Programs! Students in SNHU's bachelor's in liberal arts program can pursue a BA in general studies or specialize in communication, creative writing and English, English language and literature, or history. The BA in general studies is a great option for transfer students; the program maximizes transfer credits and allows students to earn their degree quickly. The 120-credit degree includes 60 credits of free electives, and SNHU allows students to apply up to 90 previous credits toward the degree. General studies majors choose a concentration such as accounting, creative writing, business, or sport management. SNHU's career center provides access to career advisors and internship and job opportunities. Online student services include the writing center, 24/7 online tutoring, academic advising, and the online library. Online courses are delivered asynchronously, in eight-week terms. SNHU simplifies the application process by retrieving transcripts and completing a transfer credit evaluation before contacting applicants. All online students pay the same per-credit tuition rates, regardless of residency. Southern New Hampshire University is regionally accredited by the Southern Association of Colleges and Schools Commission on Colleges (SACS). Clarion University of Pennsylvania ranks among The 50 Best Online Bachelor's in Liberal Arts Programs! Clarion University offers a bachelor's of science in liberal studies. Some students earning this liberal arts degree online have not yet decided on a major; others are interested in creating a unique, customized program that covers a variety of subjects. The degree requires 48 credits in liberal studies, and students can choose a concentration or minor. Available minors include business administration, psychology, history, information systems, and data analytics. Concentrations include library science, women and gender studies, communication, community service, English, and global understanding. Online courses are delivered through D2L. An online orientation prepares students to navigate the platform and provides tips for succeeding as an online learner. Student services include career services, an online writing center, disability support services, and online tutoring. Tutoring is available for core classes and through a learning skills lab, which helps students improve in areas such as time management, note taking, reading comprehension, and critical thinking. Pennsylvania residents pay discounted tuition rates. However, all online students pay lower tuition rates than students at the Clarion campus. Clarion University is regionally accredited by the Middle States Commission of Higher Education (MSCHE). Crown College ranks among The 50 Best Online Bachelor's in Liberal Arts Programs! The online BS in general and liberal studies at Crown College is ideal for students who want to maximize previously earned credits and for students who want to study various disciplines. Online students can customize their degree by adding a minor, such as business, counseling, biblical studies, or marketing. The liberal studies online degree requires 125 to 131 credits of Christian studies, general education, major coursework, and electives. The 33-credit major core includes 30 credits of upper-level general electives and a three-credit senior portfolio course. Each student customizes the portfolio course to their interests. Crown is one of the most affordable private institutions in the region; 98% of students receive financial aid. Online undergraduate students pay per-credit tuition rates. Applicants must submit all college transcripts. Transfer students with fewer than 24 credits should also submit high school transcripts. Admitted students register for an online orientation and work with an academic advisor to create a plan of study. Online courses are asynchronous, and students complete one course at a time. Students who have an associate degree often complete the program in two years. Crown College is regionally accredited by the Higher Learning Commission (HLC). California State University, Chico ranks among The 50 Best Online Bachelor's in Liberal Arts Programs! Chico State offers synchronous and asynchronous online programs, with start dates in the fall and spring. Chico State's bachelor's of arts in liberal studies is a degree completion program for students who have earned two years of college credits. Of the 120 required credits, 60 upper-level credits are offered online. Students can transfer up to 70 credits and can complete lower-division requirements at a community college, at a CSU campus, or through another CSU online program. The online liberal arts program covers a variety of subjects and is ideal for students who plan to teach elementary school. The degree satisfies California's content standards for K-8 teachers, but those who plan to work in education must also complete a credential program, which Chico State does not offer online. Two minors are available: sociology and career and life planning. Academic support is available by phone and online, and distance learners have access to recorded workshops in areas such as study skills and time management. California residents pay flat rates for either 0 to 6 units or more than 6 units, and out-of-state students pay an additional per-unit fee. California State University is regionally accredited by the WASC Senior College and University Commission. Limestone College ranks among The 50 Best Online Bachelor's in Liberal Arts Programs! Designed specifically for working professionals, Limestone's online programs are delivered asynchronously through Blackboard. Courses are offered in eight-week sessions, and most students take two online courses at a time. Transfer students can bring up to 66 credits from a two-year college or 92 credits from a four-year institution. Limestone offers a flexible curriculum for students earning the interdisciplinary liberal arts bachelor's degree online. The program is ideal for students planning to pursue a specialized master's degree after graduation. The 123-credit program includes 30 credits in 300-level courses, and students must earn credits in at least two academic areas, such as arts and letters, social and behavioral sciences, education, natural sciences, and professional studies. Liberal arts students complete intensive writing courses and an academic research class. Limestone's per-credit tuition rates for online courses are the same as those for evening courses. Limestone offers scholarships based on merit and need. Students can apply and enter the program at any point during the year. Applicants must submit transcripts, and students who are younger than 21 must submit standardized test scores. Limestone College is regionally accredited by the Southern Association of Colleges and Schools Commission on Colleges (SACS). Montana State University - Billings ranks among The 50 Best Online Bachelor's in Liberal Arts Programs! MSUB offers a bachelor's of science in liberal studies as a degree completion program. The program allows students who have earned at least two years of college credit to complete the remainder of their liberal arts degree online. The 120-credit program requires students to earn at least 30 credits through MSUB. Students must choose a thematic concentration in an area such as management, communications, public relations, or health administration. Students interested in other concentrations can design their own concentration with help from an advisor. Graduates pursue careers in public relations, childcare, insurance, and human resources. Online students and alumni can access internship and career assistance through the career services department. Resources available to online students include tutoring, the library, disability support services, and academic advising. Online students pay per-credit tuition rates, and discounts are available for Montana residents. MSUB waives fees related to on-campus services for online students. Financial aid is available, and more than 60% of MSUB students receive scholarships, aid, or loans. Montana State University is regionally accredited by the Northwest Commission on Colleges and Universities (NWCCU). University of Maine at Augusta ranks among The 50 Best Online Bachelor's in Liberal Arts Programs! UMA offers a 121-credit bachelor's of arts in liberal studies, which includes 75 to 77 credits in major electives. Liberal arts students choose from a variety of classes to fulfill degree requirements. Students in the online liberal arts program must declare a minor, which comprises at least 18 credits. More than 20 minors are available to online students, including behavioral sciences, business administration, human resource management, psychology, and public administration. UMA accepts applications on a rolling basis and offers start dates in spring, summer, and fall. The majority of new students at UMA are transfer students. Transfer applicants should have a minimum GPA of 2.0. Students can earn credit for training, tests, and military experience. Students must complete at least 30 credits at UMA and must maintain a 2.0 GPA. On-campus and online tuition rates are the same for Maine residents. However, out-of-state students pay significantly less for online programs than for on-campus programs. Financial aid, such as grants, scholarships, loans, and payment plans, is available. Tuition waivers are available for certain students, including as Maine residents, Canadian citizens, and senior citizens. The University of Maine is regionally accredited by the New England Association of Schools and Colleges (NEASC-CIHE). Clayton State University ranks among The 50 Best Online Bachelor's in Liberal Arts Programs! CSU's fully online bachelor's degree in liberal studies is designed for working professionals and for goal-oriented students who want to design a unique undergraduate experience. Applicants to the liberal arts program must have completed 45 credit hours of core coursework with at least a 2.0 GPA. Students pursuing the online liberal arts degree complete 121 credits and an internship that relates to the student's career goals. Students can also complete the internship at their current place of employment. Online students have access to the center for academic success, the writer's studio, and the center for advising and retention. The center for academic success offers a 24/7 tutoring service. Students are assigned a personal advisor, who helps design their curriculum and provides direction regarding support services. Students customize the curriculum based on interests and career aspirations. Online tuition excludes some traditional fees and is charge per credit. Students also pay per-credit technology and institution fees. Students residing in California or Massachusetts should contact the university regarding their eligibility for online programs. Clayton State University is regionally accredited by the Southern Association of Colleges and Schools Commission on Colleges (SACS). Portland State University ranks among The 50 Best Online Bachelor's in Liberal Arts Programs! Students pursuing PSU's bachelor's in liberal arts gain skills in critical thinking, writing, problem solving, and social responsibility. The 180-credit liberal studies online degree is one of the most flexible programs PSU offers; students work with an advisor to design a customized degree plan. Of the required credits, 81 upper-level credits must be in science, arts and letters, and social sciences. Students can apply most transfer credits earned through regionally accredited institutions to the degree completion program. Transfer applicants must have earned at least 30 college credits with a 2.25 GPA. Students with an associate degree should have a minimum 2.0 GPA. Transfer students should also have completed a writing course. Oregon high school graduates must meet requirements regarding second language proficiency. Applications are accepted on a rolling basis, and start dates are offered in fall, winter, spring, and summer. Online students have access to career services, tutoring, tech support, disability services, and the library. Online courses are delivered through the D2L platform. Online tuition is charged per credit, and Oregon residents pay discounted rates. Online students are eligible for the same scholarships, grants, and loans as on-campus students. Portland State University is regionally accredited by the Northwest Commission on Colleges and Universities (NWCCU). Rogers State University ranks among The 50 Best Online Bachelor's in Liberal Arts Programs! Courses follow a traditional schedule, with 16-week fall and spring terms and an eight-week summer term. Along with college transcripts, transfer students with fewer than 24 college credits should also submit high school transcripts and standardized test scores. Applicants receive an admissions decision within two weeks of submitting their materials. Students earning the liberal arts degree online have access to resources such as library services. uition rate for four academic years. Oklahoma residents may also be eligible for tuition waiver scholarships, which are based on merit and need. Rogers State University is regionally accredited by the Higher Learning Commission (HLC). Earning a liberal arts bachelor's degree online prepares students for a variety of career opportunities. The general nature of the degree provides a knowledge base across many subject areas, though many specific careers may require additional training or advanced degrees. Popular professions for graduates with this degree include teaching, community work, bookkeeping, sales, and real estate. Teacher assistants: These professionals help teachers with classroom instruction by working with students individually or in groups. Teaching assistants may also work exclusively with special education students. Childcare centers and traditional schools hire teacher assistants to execute tasks that streamline lesson planning, grading, and child supervision. A liberal arts degree is sufficient for teacher assistants, whereas certified teaching positions require advanced degrees and licensure. Bookkeeping, accounting, and auditing clerks: These officials record incomes and expenses for companies and organizations. Bookkeepers, accountants, and auditing clerks typically make payments, manage employee payroll, and generate reports. Some positions include budgeting and forecasting responsibilities. With minimal education requirements, many applicants receive on-the-job training. Real estate brokers and sales agents: Real estate professionals assist clients with buying and selling residential or commercial properties. This profession requires excellent attention to detail and expertise in marketing concepts and strategies. Brokers and agents must pass real estate exams for licensing, and many participate in mentorship programs upon entering the field.